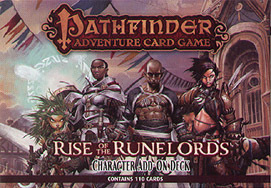 Add more players and character options to your Pathfinder Adventure Card Game experience with the Rise of the Runelord Character Add-On Deck. Inside this 110-card expansion deck you'll find four new classes for Pathfinder Adventure Card Game characters - barbarian, druid, monk and paladin - along with all the additional cards you need to expand your adventures for 5 or 6 players. New monsters, items, and more give you everything you need to face even the deadliest challenges. This deck requires Pathfinder Adventure Card Game: Rise of the Runelords Base Set.